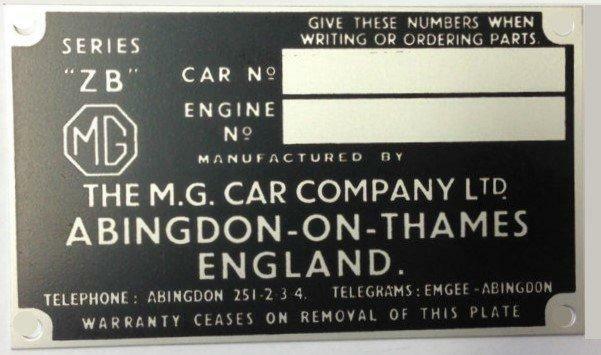 ﻿ VIN-PLATES :: Replacement vehicle identification number plates for austin morris cars. Postage charges for delivery within the UK are included in the price shown. Deliveries to the rest of the World are charged £8.50 extra. Size 80mm x 65mm. 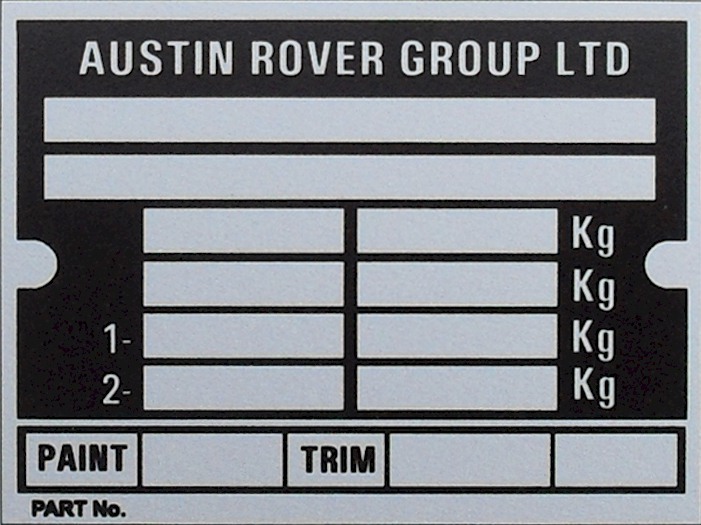 Austin Rover replacement blank VIN chassis plate. For postage to rest of World. Size 80mm x 65mm. 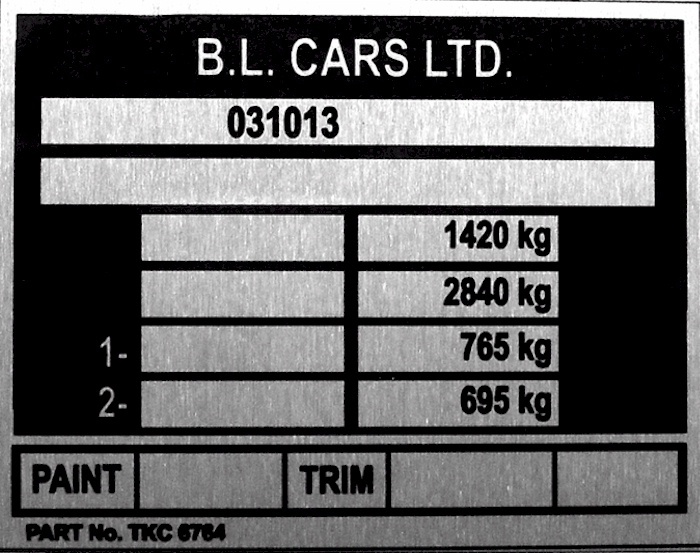 BL Cars replacement blank VIN chassis plate. Size 82mm x 62mm. 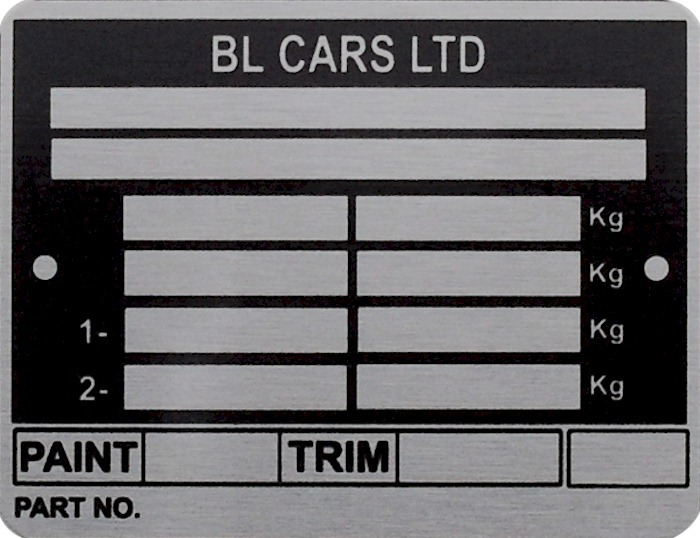 BL Cars replacement blank VIN chassis plate. Size 80mm x 65mm. 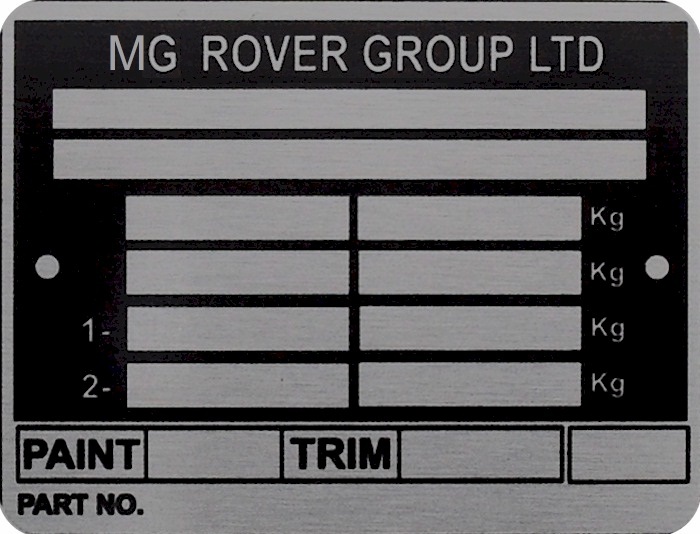 MG Rover Group replacement blank VIN chassis plate. Size 80mm x 65mm. Rover Group replacement blank VIN chassis plate. Size 90mm x 30mm. 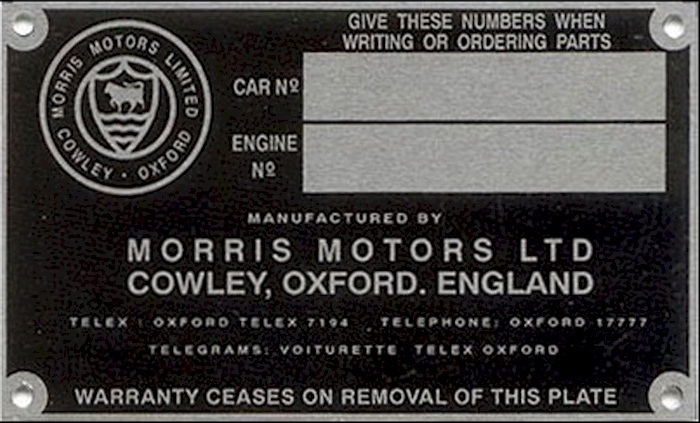 British Motor Co. replacement blank VIN chassis plate. Size 90mm x 30mm. Morris Motors. replacement blank VIN chassis plate. Size 100mm x 62mm. Morris Motors. replacement blank VIN chassis plate. Size 90mm x 30mm. Austin replacement blank VIN chassis plate. Size 90mm x 30mm. MG replacement blank VIN chassis plate. Size 85mm x 60mm. 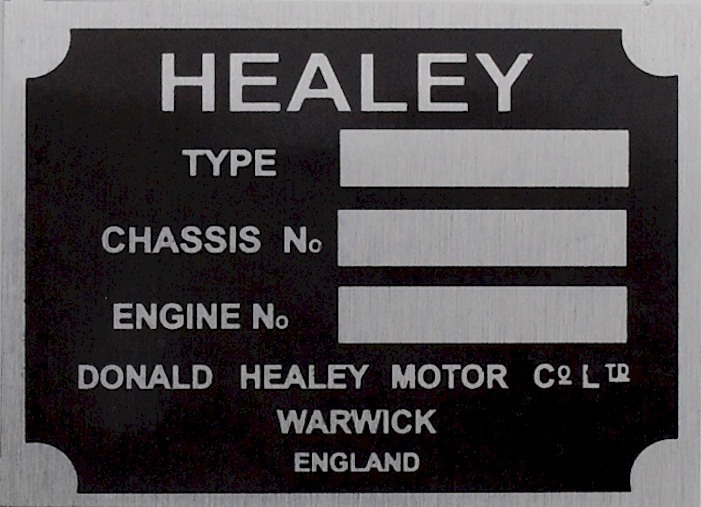 Healey replacement blank VIN chassis plate. Size 100mm x 65mm. 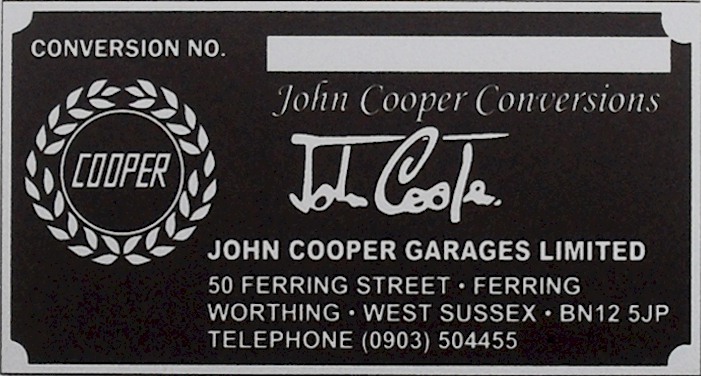 John Cooper replacement blank conversion plate. Size 100mm x 50mm. Fisholow replacement blank chassis plate. Size 200mm x 75mm. Morris 1000 van replacement blank VIN chassis plate. Size 200mm x 75mm. Morris mini van replacement blank VIN chassis plate. Size 200mm x 75mm. Morris J2 JU 250 replacement blank VIN chassis plate. Size 99mm x 76mm. 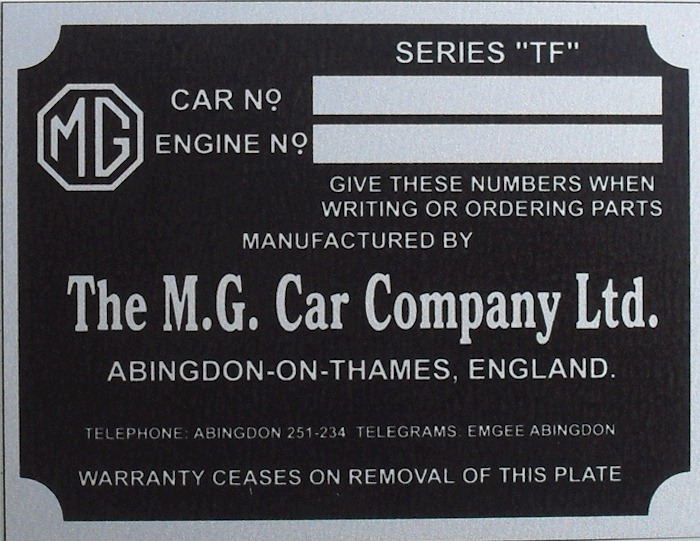 MG "TF" replacement blank VIN chassis plate. Size 99mm x 76mm. 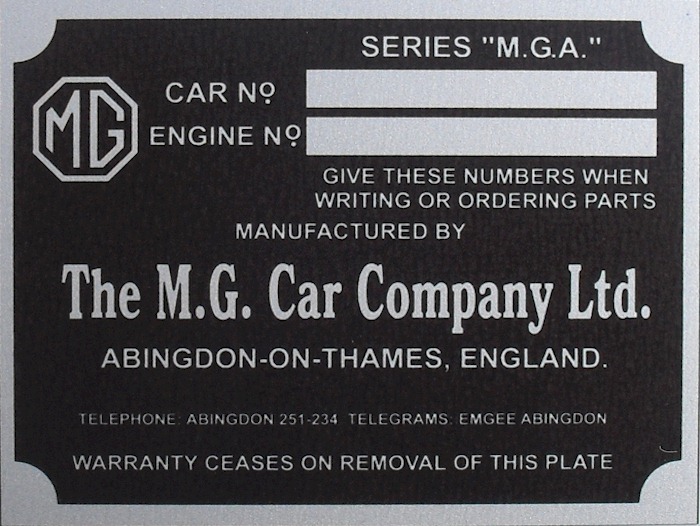 MG A replacement blank VIN chassis plate. Size 90mm x 30mm. Austin Morris replacement blank VIN chassis plate. Size 106mm x 35mm. Austin A30/ A35 replacement blank VIN chassis plate. Size 120mm x 18mm. Blank replacement VIN chassis/frame plate. Size 85mm x 18mm. Austin 7 seven green replacement VIN Chassis plate. Size 85mm x 18mm. Austin 10 ten black replacement VIN Chassis plate. Size 95mm x 32mm. Austin Princess Vanden Plas 4 litre replacement VIN Chassis plate. Size 78mm x 35mm. 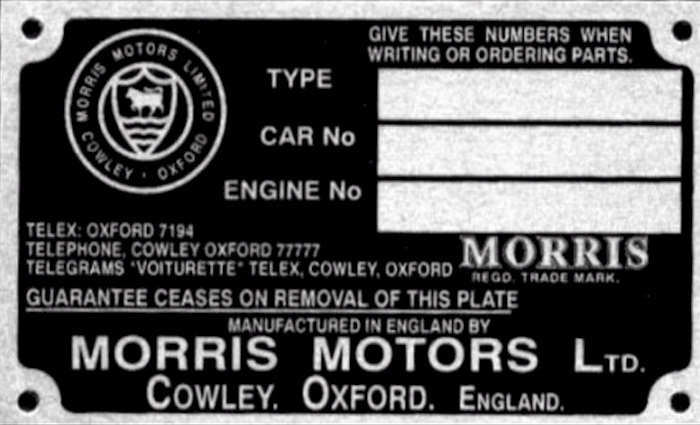 Morris Motors Osberton Works Radiator number plate.